he one end of the Bay is defined by Chapman's Peak Mountain, plunging into the sea, and on the other end is the festive Hout Bay Harbour set at the foot of Sentinel Mountain. The beachfront is backed by Nature Reserves with stunning mountain hiking trails. There are many restaurants and café’s along the Hout Bay beach front to enjoy fresh coffee, cocktails or scrumptious meals from breakfast to dinner. Llandudno’s beautiful sheltered beach with boulders and surf spots is only a 5 minutes drive away, so it’s easy to alternate between the two beaches. here is a beautiful pristine beach 5 minutes drive from the house, called Llundudno beach. The sun sets in the Ocean, and there are large boulders to climb on and watch the sunset. This is an absolutely gorgeous beach, with white sand and very popular with locals, as well as tourist. out Bay village is a very popular tourist destination for families and travelers as it is very close to Cape Town and has a large variety of activities to offer, as well as all amenities such as wonderful shopping centre’s, art galleries and craft shops, fantastic food and craft markets, lovely deli’s and many excellent restaurants. Hout Bay has character and charm with a wonderful balance between the old and new, with a rich history and a modern pace. The ‘World of Birds’ with the famous monkey jungle, where the mischievous squirrel monkeys play with kids and adults, is a ‘must’ on the list of things to do. out Bay has its own working harbour that is the home of the tuna, snoek and crayfish fleets. Choose your own 'catch of the day’ from the fish market or take a boat trip to Seal Island. Experience jet skiing and high speed boat trips as well as spectacular daily cruises. Watch the seals and seagulls enjoy the treats from the fishermen at the harbour, or the fishermen at work. Enjoy the festivity and the vibe of mixed cultures, whilst being entertained with traditional music of the Cape Minstrels in their colourful attire. out Bay has a wonderful variety of markets, all with great ambiance and well worth a visit. The famous Sunday Craft market is a fabulous fair for all to enjoy, including pony rides and jumping castles to keep the children happy. There is a food market on Saturday mornings at La Cuccina deli and fresh fish to be bought from the daily fish markets in the harbour. But the new indoor BAY HARBOUR MARKET right at the end of the harbour (park at 'Fish on the Rocks' restaurant) beats them all, open on Saturdays and Sundays between 9am and 5pm. This market is very similar to the famous market at the ‘Old Biscuit Mill’ in Woodstock, with many yummie food stalls and interesting crafts, clothes and vintage stores. Unlike the ‘Old Biscuit Mill’ market, the Hout Bay Harbour market is also child friendly and suitable for a family outing as it offers cake and sweet stalls, kids entertainment and playgrounds. out Bay offers many delicious Deli’s and fine Seafood restaurants in spectacular settings. 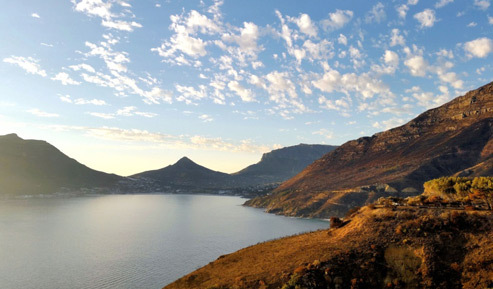 here are many, many scenic walks, picnic spots and hikes to choose from in and around Hout Bay. From easy circular forest walks at Constantia Nek to stunning hikes for more experienced hikers, such as the Karbonkelberg hike from above the harbour, or the most mind-blowing hike up Chapman’s Peak. There are ample mountain-bike trails as well. here are various beautiful wine farms in close proximity to Hout Bay. 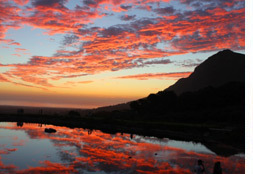 The most specyacular one is situated in Noordhoek, the Cape Point Vineyards, a mere 15 minute drive over Chapmans' Peak. The Cape Point Vineyards boast 360 degrees panoramic views, over the dam, the ocean, the vineyards sloping up the mountains and the beautifully tendered gardens. There is a vibrant Foodmarket on Cape Point Vineyards on Thursday evenings, not to be missed! One can also pre-order a picnic basket and have a picnic on the estate, or a fine dining experience with beautiful sunsets over the lake and ocean. The most famous wine farm nearby would be the historical 'Groot Constantia' wine estate, ten minutes drive from Hout Bay. On Constantia Nek, 5 minutes drive from the house, starts the Constantia Wine Route. Some wine farms well worth a visit for lunch or wine tasting to enjoy the beautiful views are Constantia Glen and Beau Constantia (nice Sushi! 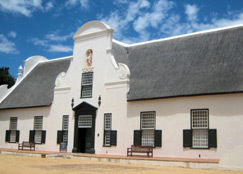 ), Constantia Uitsig and Klein Constantia. Steenberg security estate, a little further away, also has a lovely wine tasting in modern setting. This double-decker bus is better known as the Red Bus, and with its open rooftop is a real head turner. They stop by the Hout Bay Harbour, 400 meters walk from the cottage by Mariners Warf. The Red Bus offers open top bus tours, boat cruises and guided day tours. Each bus has a prepared commentary in 15 different spoken languages. For the kids on board there's even a fun channel to keep them entertained. The tours are exciting, different and provide insightful information on the surroundings while on the bus. There are many stops on the route where you can explore the various attractions Cape Town has to offer, including the beautiful Kirstenbosch Botanical gardens and the interesting T-bag art factory at our local Township. It is an exciting experience to hop on and off at these various Red bus stops to explore Cape Town. A red bus ticket allows you to hop on and hop off on all their tours. Tickets can be bought at their tour offices, online at a discounted rate or from the bus driver. Swim and snorkel with the Seals! Hout Bay is renowned for its seals. On an average day while walking around the Harbour you will be able to spot many of these adorable, playful creatures lazing about on the jetty's or playing around in the water giving a quick wave to curious on lookers. Tourists and locals a like are able to put on a wetsuit and snorkel with these playfully adorable mammals. The two main companies taking visitors for a seal snorkel experience are Animal Ocean and Cape Town Bucket list. Cape Fur seals are present in Hout Bay and in their colony on Dyer island throughout the year but the best time to go is in the summer months, April in particular is great as this is when the seal pups start to learn to swim. Explore Hout Bay in a fun and Eco-Friendly way on an electrical bicycle! Rent a GoNow Bike and at a press of a button riding uphill became easy. There are also e-Bike cultural tours, offered by local Rastafarian Fishermen. These guided Hangberg Rastafari and Khoi culture tours are an interesting way to explore a true fishing village culture and see the joys and daily challenges of the Hangberg community, right at our doorstep. Contact Karbonkelberg Tourism for more information. he climate is Mediterranean. In the summer months (Nov-Mar) it is sunny, warm and generally dry with temperatures averaging around 20-35 degrees. Winter is known as the secret season in the Cape. Temperatures cool considerably (especially at night), with a greater chance of rain and storms. However, during the day, winter temperatures can easily rise to 20-25 degrees with blue skies and emerald green landscapes, giving Cape winters a better climate than UK and Dutch summers! Spring and autumn are wonderful times for a visit, though always bring a warm top for the evenings. The best time for watching the Southern Right whales in South African waters is from June to October. Peak calving season is July and August, but whales can be seen throughout September and October, frolicking in the bay – on your doorstep. Useful search terms: table mountain, Constantia wine route, golf courses in Cape Town, golf near Hout Bay, Restaurants in Hout Bay, Noordhoek farm village, surfing in Cape Town, mountain biking, Hout Bay Harbour Market, Hout Bay market, Hout Bay harbour market, deli in Hout Bay, Hout Bay boat trips, Karbonkelberg hike, Chapman’s peak hike, best picnic spots in Cape Town, Greek Restaurant in Hout Bay, Thai Restaurant in Hout Bay, Mariner’s Wharf, Hout Bay Sunday market, World of birds, Hout Bay beach, Llandudno Beach.